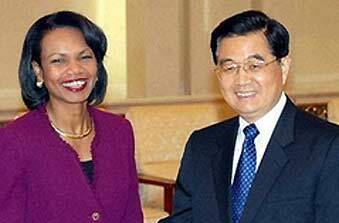 Washington - US Secretary of State Condoleezza Rice played down concerns over the rising influence of China, saying it was better for China to have friends in the world than enemies. "I don't see any of this as zero sum," Rice told the Singapore Straits Times newspaper in an interview, a transcript of which was released by the US State Department on Thursday. Rice was responding to a question on China's growing power and relations with nations from Asia to Africa, notably following a summit of 48 African leaders in Beijing last week that highlighted the China's deepening economic and political ties with the continent. "I'd like to have China have friends in the world, it's better than having China have enemies in the world," said Rice. "There have been times when we worried about the opposite -- that China would be a destabilizing factor in the world," she said. "So I would rather see a China that is trying to reach out, that's trying to have friendships around the world." Rice visited Beijing two weeks ago and praised the Chinese for their leading role in bringing North Korea back to multilateral negotiations aimed at getting Pyongyang to give up its newly proven nuclear arsenal. "We have excellent relations with China," she said. However, 10 days ahead of an Asian summit at which US President George W. Bush will meet his Chinese counterpart Hu Jintao, Rice also mentioned that Washington still harbored concerns about China's role. "China has to be responsible in its engagement with the world because it is a big power, it's not just a developing country," she said.